The Westcott 43" Collapsible Umbrella Flash Kit with Stand travels well--the 43" (1 m) umbrella collapses to a length of just 14.5" (36.8 cm) and can be used as a bounce umbrella (using the included black cover) or as a shoot-through (by removing the black cover), for two different types of light. The shoe mount fits a wide variety of portable flash units, and the 8' (2.43 m) all-metal light stand is durable but lightweight. A useful companion for the mobile photographer. Box Dimensions (LxWxH) 27.4 x 6.75 x 4.0"
43" Collapsible Umbrella Flash Kit with Stand is rated 4.2 out of 5 by 140. Rated 5 out of 5 by Richard Harris from Excellent Value! I shoot through the white umbrella with a Nikon SB-910 (which mounts to the cold shoe just fine). I don't really like the way the black shell attaches to the white umbrella (you have to align the end caps and then keep them in place as you open the umbrella), but, as I said, I don't use the black cover so I just leave it off. I use other reflectors and diffusers, but sometimes you just need a quick setup and shoot through an umbrella. And this works just fine for that. It would have been nice if they included a case, but then again it's pretty darn inexpensive so it's hard to argue that point. It's definitely an excellent value as it is. Rated 3 out of 5 by Chad from Good for the occasional user This product is ideal if you are on a tight budget and don't plan to use it frequently. The umbrella is on the larger side and, as such, it works well for shoot-through applications such as portraiture or product photography. As mentioned by a previous reviewer, the black removable bounce cover on the umbrella is not well designed. The little caps are hard to secure over the tips of the ribs on the umbrella and often come loose. The umbrella also lacks a strap that would make it much easier to close for storage. The stand and flash/umbrella bracket are workable but build quality is not the best. Rated 4 out of 5 by Bethany-Noel from Umbrella Flash Kit I bought this to have something lightweight to carry with me, and I didn't want to spend a ton of money, so when I saw this set, I decided to give it a try. There are a lot of reviews on this stand, saying that it is a little flemsy and unstable, but I thought the quality was qutie good for the price that it is. I havn't have any problems with it. The umbrella is handy, and I havn't had a problem folding it, or putting it in the case either. I am very happy with it in whole. All in all, I'm glad I bought it, and would do it again. 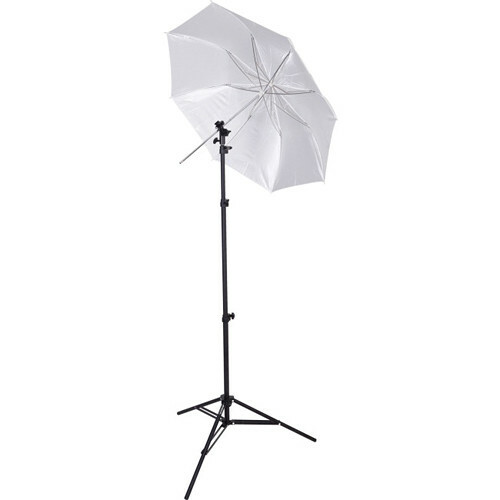 Rated 5 out of 5 by Harry from Great Portable Studio Flash and Umbrella Stand Lightweight, strong and convertible. A cost efficient Umbrella Flash Kit that can be used as a reflector for your flash or shoot through. The Umbrella is good size that fits almost anywhere when I am on location. The stand is very sturdy and easy to adjust. I am extermely happy with this product. Rated 4 out of 5 by LBS Photo Girl from Good Overall Kit for Beginners I am new to studio lighting and this is my first lighting kit. I am using it with an old Canon 420EZ flash, which is the only lighting/strobe in the studio. The setup was easy and mostly self-explanatory for a first-time light kit user. The umbrella provides nice light diffusion as both a shoot-through or reflective, although I tend to prefer the shoot-through. Either way, it is a huge improvement over using the flash without any diffusion. The black umbrella cover is easy enough to remove, but you do have to close down the umbrella to remove/put on the cover. Overall a good product and I would consider buying another one when I get a second strobe. A good value. Rated 4 out of 5 by Alberto from Worth the price For the price it is a good deal. If you are expecting heavy duty pro gear you'll need to spend a whole light more. But if you want a functional starter kit this is it. Great for indoor use and outside without wind. The stand has plastic fasteners but does the job. The cold shoe/umbrella mount is the highest quality piece in the set. The umbrella is pain to switch from reflective to shoot through, so I decided to leave it set for shoot through. At this price you don't get a carrying case, but the umbrella comes with a nice sleeve. Overall worth every cent I paid for. As I get better I can see adding to this set with better quality materials but for now it gets the job done. Rated 3 out of 5 by FEChariot from Good product with some flaws The umbrella is a collapsible umbrella. This is good for small size, but putting it back together in the included sheath is a chore. My other umbrella is the Westcott 45 shoot through with removable backing. The 45 only folds in and has a Velcro strap that lets you close it up and go much quicker. The umbrella bracket is solidly made, but suffers one fatal flaw for users of Canon's wireless and probably Nikon's CLS in that you can't rotate the speedlite in the bracket. You can only mount the speedlite at 0 degrees or 180 degrees. With my other bracket, an Impact $18 one (B&H #IMBSM), I can rotate at any angle so it can see the master trigger flash better. The cold shoe in this Westcott bracket is much nicer though than the Impact. The light stand is just what I wanted. It is light and collapses small. It's good enough for a speedlite. This particular set does not come with a carrying case just the stand, bracket and umbrella. I purchased a carrying case from another brand.